Light-emitting diodes (LED bulbs) last longer and provide more energy savings than traditional light fixtures by using up to 90% less power than other light bulbs. The glowing ambiance of the Twist decorative lamp provides an aura as relaxing as candlelight without producing heat or the high risk of a fire. The sturdy 8 inch base and embracing glow of the Twist are sure to catch the eye of even the hardest to impress guests as they marvel at its wonder, even if they think you will not notice them looking at it! 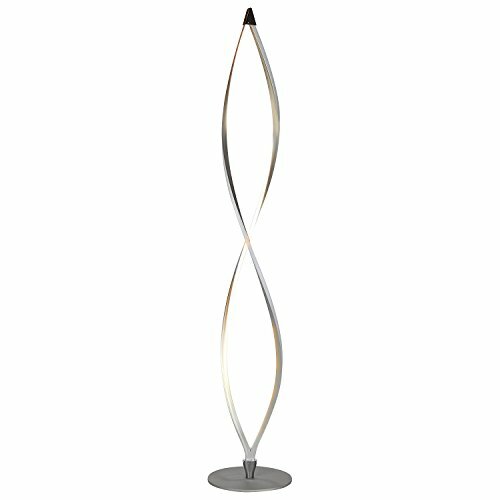 From family living rooms to professional business settings, the Twist LED Floor Lamp will look and feel right at home using cutting edge style and technology to back it up. MODERN, VERSATILE FAMILY ROOM OR OFFICE LAMP - Fitting easily in corners or buy two to frame a bookcase or TV, the Brightech Twist's futuristic vibe of the Twist lends clean architectural lines to any space. It spirals to 43 inches high and easily suits a variety of rooms from the TV or rec room to a study, waiting room or office. BRIGHT, WITH BUILT IN DIMMER - The Brightech Twist produces a bright (950 lumens), yet diffused warm white light (3,000K) your room in every direction. Tap the built in foot-switch dimmer to adjust the light - once to turn on, twice to dim to 50%, a third time to 30% brightness and tap again to turn off. NOT compatible with wall switches or timers and the lamp itself cannot be twisted. TWIST AND SHINE - Made using non-toxic material, the LED Twist Lamp is more environmentally friendly than fluorescent strips known to contain toxic chemicals such as the pollutant mercury. Since advanced LED technology lasts longer than old school light bulbs, the stylish Twist accent lamp will reduce the amount of resources used to keep homes lit well into the future while saving money on electricity bills at the same time. Compatible with 120-220 volt outlets. INTERIOR DESIGN FLEXIBILITY - Brightech takes pride in designing functional lighting using innovative designs blended with designer style at a reasonable price. This dimmable LED lamp is versatile and can be used in any location whether it's to make your house or apartment feel more like a home, or to make an office space more comfortable. Its unique design makes for a great conversation piece while enhancing any kind of traditional, urban, contemporary, or minimalist décor.